The normal heartbeat results from a series of electrical and mechanical actions that result in forward output of blood. Alterations in cardiac performance occur from changes in heart rate and contractility in response to variation in auto-nomic tone and metabolic stress. To carry this out, the heart has developed a specialized conduction system. Figure 27-29 A, Baseline angiogram of the right superficial femoral artery demonstrates a short, chronic total occlusion. B, Angiogram of the same artery 2 weeks after stent placement. 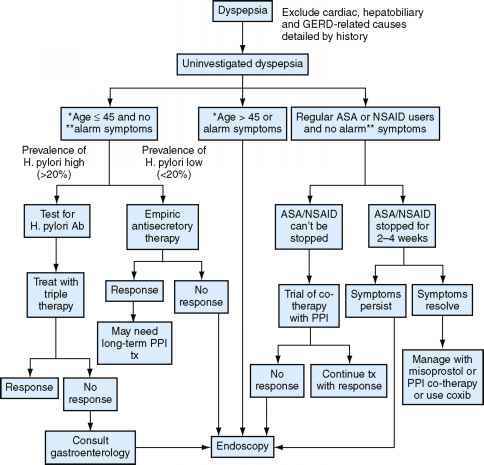 Figure 27-30 Management algorithm for patients with peripheral vascular disease. 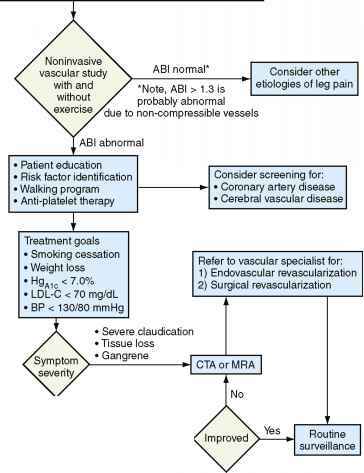 ABl, Ankle-brachial index; BP, blood pressure; CTA, computed tomographic angiography; HbAlc, hemoglobin Alc; LDL, low-density lipoprotein cholesterol; MRA, magnetic resonance angiography. (Schlant et al., 1994). The sinus node includes three types of cells: nodal cells, transitional cells, and atrial muscle cells. Impulse formation and rhythmicity in primates are influenced by rich innervation with postganglionic adrenergic and cholinergic nerve terminals (Billman et al., 1989). Impulses leaving the sinus node complex travel through the right and left atria and converge on the atrioventricular node. Controversy still exists as to whether conduction spreads preferentially through specialized internodal and interatrial conduction pathways of the anterior, middle and posterior internodal pathways or simply through atrial myocytes (Racker, 1989). Regardless, right and left atrial depolarization occurs over 55 to 100 milliseconds (ms), resulting in the surface P wave. Cells residing in the SA node complex are predominantly Ca++ dependent, slow conducting, and have a higher resting membrane potential than atrial or ventricular myocytes and Purkinje tissue (Sperelakis, 1979). The atrioventricular (AV) node lies at the apex of the triangle of Koch. This is formed by the septal leaflet of the tricuspid valve and the tendon of Todaro (Anderson et al., 1988). The AV node is subendocardial and is not visible on gross inspection. The node extends through the AV groove into the ventricle as the His bundle, before branching into the right and left bundle branches of the His-Purkinje system. The AV node contains cells similar to the sinus node P cells. These cells and the associated transitional cells comprise a slow-conducting structure richly innervated with cholinergic and adrenergic fibers. Automaticity and conduction speed are influenced by this innervation. Slow, calcium-dependent cells predominate in the AV node. Conduction time through the AV node is approximated from the end of the P wave to the onset of the QRS complex. The distal portion of the AV node becomes the His bundle. These cells have fast-conducting, sodium channel-dependent cells with more negative resting potentials. Branching off into the right and left bundle branches and finally the endocardial Purkinje network, these fibers transmit impulses 10 times faster than atrial or ventricular myocytes and 50 to 60 times faster than sinus or AV nodal cells (Sperelakis, 1979). Rapid activation of the His-Purkinje network results in global, nearly simultaneous activation of the right and left ventricular myocytes. Purkinje activation results in a narrow QRS complex (<120 msec) noted on the surface ECG. Abnormalities of the right or left bundle braches result in slower activation of myocardium through cell-cell activation and thus the typical wide bundle branch block QRS on the surface ECG (>120 msec). Myocardial cells are specialized cells designed to shorten when activated by a threshold electrical stimulus, thus providing mechanical force to produce contraction. The cell membrane is characterized by fast, sodium channel activation. Depolarization of the cell results in release of sarco-plasmic calcium and cardiac cell contraction. Conduction velocities are intermediate between SA and AV nodal cells and the Purkinje cells. Cell death, injury resulting in scarring or functional conduction slowing, or changes in cellular automaticity may result in clinical arrhythmias (Zipes, 1992).